Travelling to a foreign country for work sounds like a fun thing to do. You benefit immensely as you meet a whole lot of people and learn new ways to work better and socialize.Plus it sounds so appealing when your friends speak about how much they love travelling due to office purposes since they get to visit new places that are absolutely free of cost. The truth is, there are perks! Of course you will benefit a lot when you move to a foreign country. But the sad part is that the benefits are not as many as you would like to think. There are some defects as well. On that note, let us tell you some of the top reasons as to why you should not move to a different country. 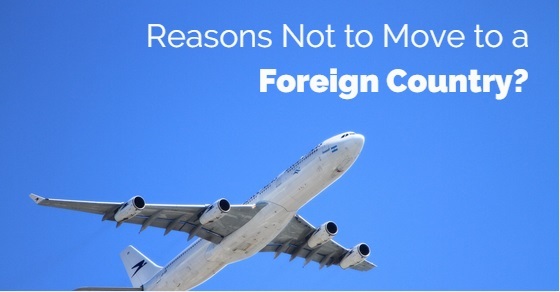 Moving to a foreign place will definitely not improve your love life or relationships. There are so many people who have shifted to different countries because love hasn’t worked very well in their lives. And to be very honest, leaving your home town is not going to help all that much. You might go to a different country but the problems are not going to change one single bit. If you feel a bit romantically stifled at home, stop and think what you are really after. Then you will definitely be able to find solutions. We all want some taste of adventure at some point of our lives. Going through the same monotonous routine every now and then sounds horrible and you will need to infuse some excitement in order to get away from this. Some of you think the solution lies in shifting to a new country but trust us when we say this… it might not always be. Always remember adventure is not about the place. Adventure lies within you. Moving abroad sounds fun but don’t do that for something like “adventure”. One of the saddest points is when you want to go abroad and don’t know the first language there. Of course it is very difficult to learn one. So if you thought this one is going to be easy, think twice. Learning a language that is foreign to you not only takes up a lot of time but also makes things difficult. How are you going to communicate till then? Think about it! You are not going to enjoy things the moment you enter. First of all, it’s a new country and the rules aren’t going to be the same. The people and culture is different. You might have a difficult time trying to adjust. You might not even live up to their expectations for a bit. Plus you could suffer with a cultural shock for weeks. So if you are thinking of setting abroad, always rethink your decision. When you are home, there will be a lot of things you will like and get used to. But obviously when you shift abroad, things change and there are times when you will feel like you miss the smallest things that once never bothered you. That happens because your surrounding is new and you will need some time in order to adjust yourself and get comfortable. It happens to almost everyone. So, think twice before making a decision. Now you must have noticed this quality among most internationals. In fact, this is one of the biggest side effects of moving abroad. People tend to get very emotional about their country and try to get into any conversation that speaks about their community. And that also gives you a bad impression in front of others. Your family and friends are going to be very upset. Even though they are going to be proud of you and what you are doing with your career, they will still be unhappy since they won’t get to see you for a bit. And that is sad for anyone! Friends are something you will definitely lose when you move to a different country. Because here you will have to work on finding new people who suit your personality and will be there for you when you need them! Finding new friends can be quite difficult in a way if you look at it. Plus you don’t even know if you are going to get along with anyone at first. Also there is a huge difference when you visit new countries. Studies say that people tend to feel jittery and nervous as a result of which they are unable to make pals fast. Another sad point could be fitting in. It is obviously not easy to fit in. When you travel to a country that is not even yours in the first place, there will be times when you feel like what you are really doing here. Some will also see you with a suspicious eye. And especially since you are not aware of the culture, you will go through a tough time trying to fit in. New beginning sounds fun at first. But remember it also means you will have to start life from scratch. And that can be a real pain. Here is where you will have to learn about new tips, tricks and tactics in order to make life easier for yourself. Not only do you have to keep the basic rules in mind but also remember that you are a foreigner and that things are not going to come to you all that easily. You have to learn basic things about the bakery and supermarket and other places so that you don’t get lost. If you have been in a relationship with your lover for a very long time, this is really going to become a negative because you will have to shift abroad. Communication will be reduced to Skype, calls and texts. You might not have enough time for them like you had at one point. Either you will have to plan on making trips back to your home country every couple of months or even work towards finding a new love. Moving to a foreign country is expensive. You are expected to spend a whole lot of money on travelling and going off to far away distances. You might have to rent an expensive apartment and spend a whole lot of money in order to get your life together. This will happen for a couple of months until you have completely adjusted yourself. Plus you will need someone who can help you with stuff like this so that you don’t end up investing money into things that are too expensive. Even if you get citizenship, you will never become them. Everyone will still look at you as if you are a foreigner. You will also have to broaden your resume by learning new skills. People are always going to treat you in a different way and look at you strangely as if you’ve arrived from a different planet. Plus you will feel at times like there is a huge cultural gap and you don’t seem to understand why people here do things that are so different than your culture. All of this is hard but natural. The worst part is that you are not going to be in good touch with people back at home. Whether it’s your friends, family members or even those who worked at office with you! Nobody is going to have the same connection with you like they used to. You will actually lose contact with a whole lot of people more than you expected. It will get worse if you don’t have social media already even though it is not possible to speak to every person you met back at home. So that brings us to the end of the post. Working abroad has several benefits. But it has some negative points as well. It surely isn’t a bad idea to go to a different country! But if you haven’t thought about this decision, then it’s high time you do so. Things will mess up and work against your favour if you aren’t sure of what you want. Plus you will have to learn how to adjust! So if you can handle that, go for it! If not, stay and work on yourself. Previous articleHow to Look Good for a Modeling Interview?